In twenty-first century, very few can imagine life without a computer.Now all the operations we carry out are only on the computer. We get scared to think about what it would have to,if we have to write some text on paper and handle it, because we can easily do it on the computer, check out all the mistakes and print it.Now, we had reached on the era of Cloud Computing and 3D Printing. 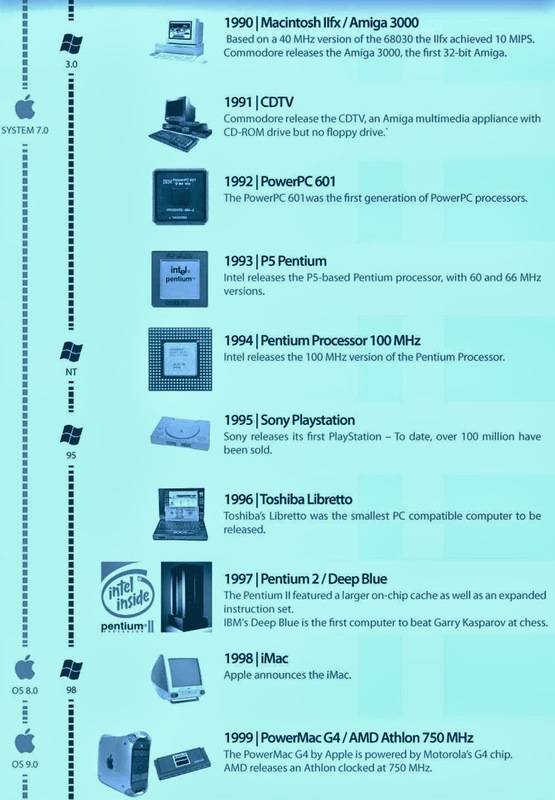 In this section, we would like to tell you about how the computer evolution took place. 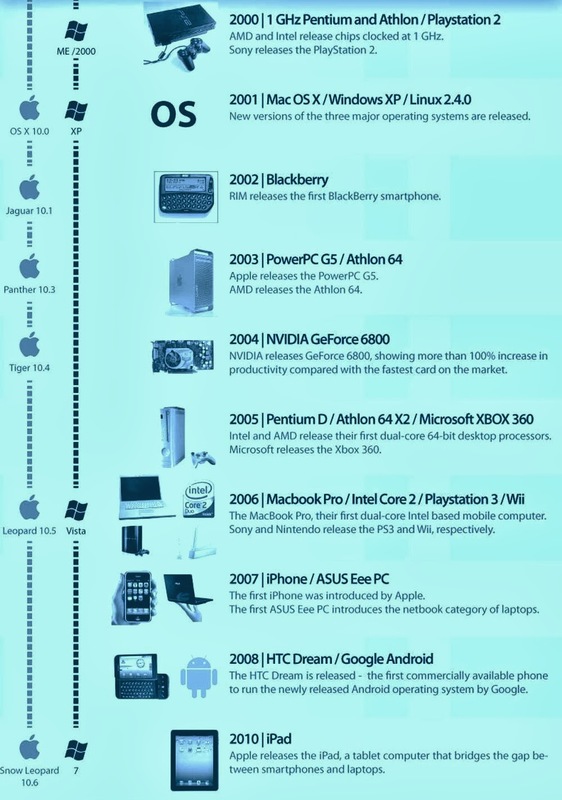 Back in the forties, computer can be compared only with some very big device. Just imagine that for a single computer, it required a lot of electronic equipment and a large spacious room. At that time, the very first computers worked only on a very expensive vacuum tubes. 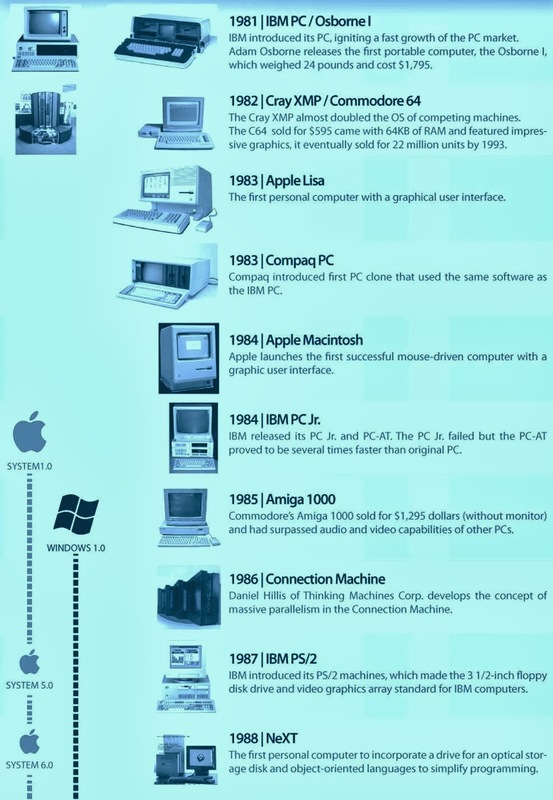 Computers were afforded by just big companies and big institutions. 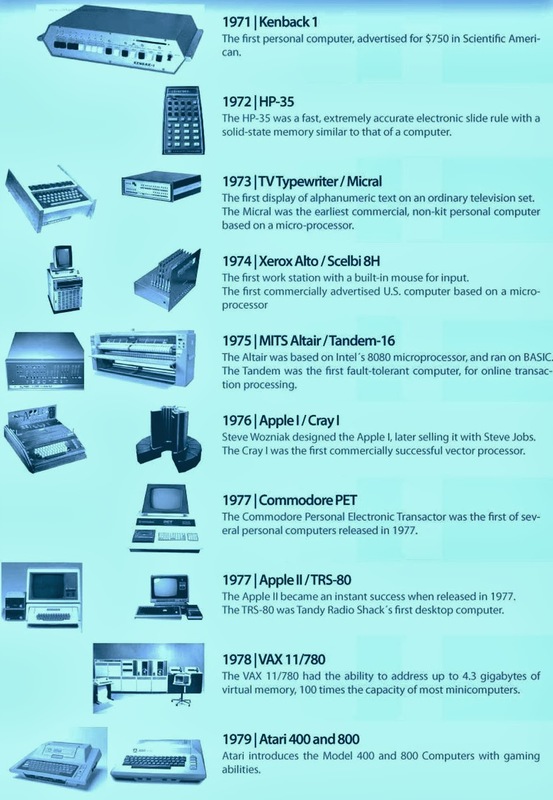 Here are the details of how computer technology evoled in all these years. 1950: floppy disk from the Tokyo Imperial University Yoshiro Nakamats invention. Its marketing rights obtained by IBM. Created storage era. 1951: Grace Murray Hopper completed a high-level language compiler. 1951: Whirlwind: U.S. Air Force’s first computer-controlled real-time defense system development is completed. 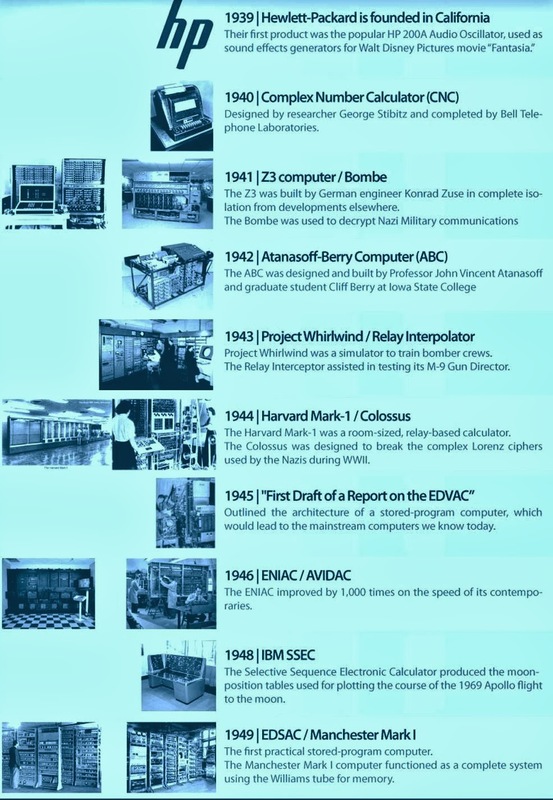 1951: UNIVAC-1: the first commercial computer systems. Designer: J. Presper Eckert and John Mauchly. Used by the U.S. Census Department census, marking computer applications into a new era of commercial applications. 1952: EDVAC (Electronic Discrete Variable Computer): led by the Von Neumann designed and completed. Name: Electronic Discrete Variable Computer. 1953: At this point in the world there are about 100 computers in operation. 1953: core memory is developed. 1954: IBM’s John Backus and his research team began developing FORTRAN (FORmula TRANslation), 1957 years to complete. Is a suitable computer language used in scientific research. 1956: The first conference on artificial intelligence was held at Dartmouth College. 1957: IBM developed the first dot-matrix printers. 1957: FORTRAN successful development of high-level language. 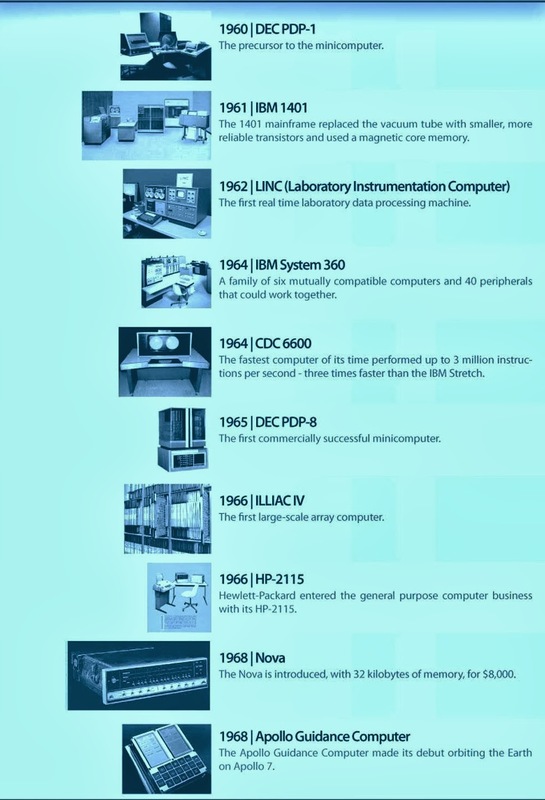 1959: 1959 to 1964 designed computer generally known as the second generation of computers. Extensive use of transistors and printed circuits. Computer volume shrinking function continuously enhanced to run FORTRAN and COBOL, receiving English characters command. A large number of applications. 1959: Grace Murray Hopper began to develop COBOL (COmmon Business-Orientated Language) language, was completed in 1961. Despite using transistors greatly reduced the size of the computer, reducing its price, reducing the failure. But from the requirements of the people are still far worse, and the various sectors of the computer also had a greater demand, production more stronger, lighter, cheaper machines has become a priority, and the invention of integrated circuits as “timely” when spring is here. Its high degree of integration, not only so that the volume is reduced, but also the speed, fault reduction. People began to manufacture a revolutionary microprocessor. Computer technology after years of accumulation, and finally onto a silicon paved highway. September 12, 1958: In the Robert Noyce (INTEL company’s founder) under the leadership of the invention of the integrated circuit. And soon launched a microprocessor. But since the invention of the microprocessor is borrowed from Japanese company’s technology, so the Japanese patent does not recognize them, because the Japanese did not receive due benefits. Over 30 years, the Japanese admitted, so Japanese companies can gain a portion of the profits. But in 2001, the patent also fails. 1960: ALGOL: first a structured programming language introduced. 1961: IBM’s Kennth Iverson launched APL programming language. 1963: PDP-8: DEC introduced the first minicomputer. 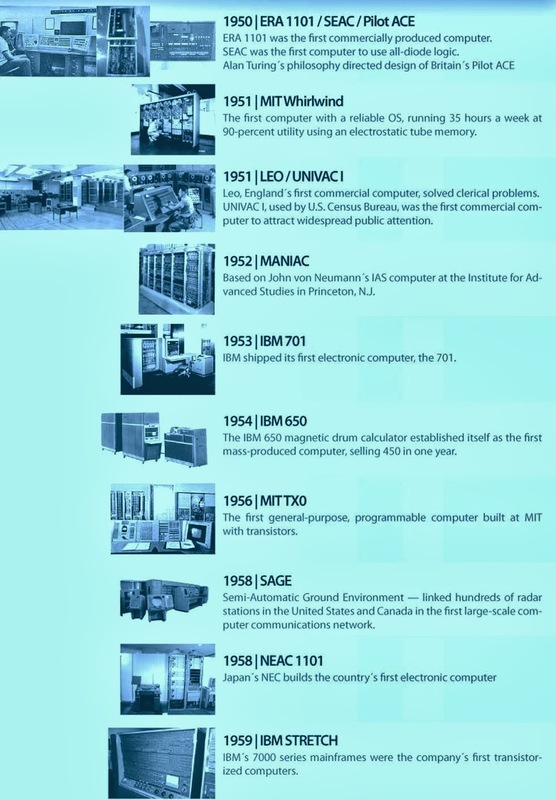 1964: 1964 to 1972 computers generally known as the third generation of computers. Extensive use of integrated circuits, the typical model is IBM360 series. 1964: IBM released PL / 1 programming language. 1964: the first set released IBM 360 series compatible. 1964: DEC released PDB-8 minicomputer. 1965: Moore’s published processor performance doubling every year. Later, its content has changed. 1965: Lofti Zadeh founded fuzzy logic to handle approximation problem. 1965: Thomas E. Kurtz and John Kemeny complete BASIC (Beginners All Purpose Symbolic Instruction Code) language development. Particularly suitable for computer education and beginners, has been widely promoted. 1965: Douglas Englebart put forward the idea of ​​a mouse, but no further. Until 1983 by Apple Computer, Inc. widely adopted. 1965: The first supercomputer CD6600 developed. 1967: Niklaus Wirth began developing the PASCAL language, completed in 1971. 1968: Robert Noyce and several of his friends founded the INTEL Corporation. 1968: Seymour Paper and his research group at MIT developed the LOGO language. 1969: ARPANET program started, this is the prototype of the modern INTERNET. April 7, 1969: The first launch of a network protocol standard RFC. 1970: The first one RAM chip introduced by the INTEL capacity 1K. 1970: Ken Thomson and Dennis Ritchie began developing the UNIX operating system. 1970: Forth programming language developed. 1970: Internet prototype of the ARPAnet (Advanced Research Projects Agency network) basically completed. Non-military departments began to open, many universities and the business sector began to access. November 15, 1971: Marcian E. Hoff in the successful development of a company INTEL 4004 microprocessor , with 2,300 transistors, is a four system clock frequency 108KHz, 60,000 instructions per second. In subsequent days, the development of key indicators processor glance. 1971: PASCAL language development is completed. 1972: 1972 after a computer used to be called the fourth generation of computers. Based on LSI and VLSI later. Computers more powerful, smaller. People began to suspect that your computer can continue to shrink, especially heat problems can be resolved? People began to explore the development of fifth generation computers. 1972: C language development is completed. Its main designer was one of the developers of UNIX systems Dennis Ritche. This is a very powerful language development system software, especially loved by others. 1972: Hewlett-Packard invented the first hand-held calculator. April 1, 1972: INTEL launched 8008 microprocessor . 1972: ARPANET began to move toward the world, INTERNET revolution began. 1973: Pong arcade game released, has been widely welcomed. Inventor Nolan Bushnell, founder of Atari later. 1974: The first one has a parallel computer architecture CLIP-4 launch. Five, computer technology getting into the brilliant. Before this, computer technology mainly in mainframes and minicomputers areas of development, but with the ultra-large scale integrated circuit and microprocessor technology, computer technology into the homes of ordinary people barrier layers have been exceeded. Especially from INTEL released its microprocessors for personal computers after 8080, this will be the surging tide up, but also the emergence of a large number of beach-goers the information age, such as Steve Jobs, Bill Gates, etc., since they are computer industry development also plays an important role. In this period, the Internet technology, multimedia technology has also been an unprecedented development, the computer really started to change people’s lives. 1974 April 1: INTEL released its 8080 8-bit microprocessor chip. December 1974: MITS released Altair 8800, the first commercial personal computer, valued at $ 397, with 256 bytes of memory. 1975: Bill Gates and Paul Allen finished first in the MITS Altair BASIC program running on the computer. 1975: IBM Corporation introduced his laser printer technology. 1988 to market its color laser printers. 1975: Bill Gates and Paul Allen founded Microsoft company. Now become the largest and most successful software company. Three years after the income of $ 500,000, increased to 15 people. 1992 amounted to $ 2.8 billion, 10,000 employees. The biggest breakthrough was in 1981 for the IBM PC, operating system development, from the beginning after a huge impact on the computer industry. 1976: Stephen Wozinak and Stephen Jobs founded Apple Computer Corporation. And launched its Apple I computer. 1976: Zilog Z80 processor launch. 8-bit microprocessor. CP / M is an operating system for its development. Many well-known software such as: Wordstar and dBase II X5470 processors. 1976: 6502, 8-bit microprocessor release, designed for Apple II computers. 1976: Cray 1, the first commercial supercomputer. Integrates 200,000 transistors per second for 1.5 billion floating-point operations. May 1977: Apple II computer model release. 1978: Commodore Pet Release: there 8K RAM, cassette deck, 9 inches monitor. June 8, 1978: INTEL released its 16-bit microprocessor 8086. But because of its very expensive, it launched 8 of 8088 to meet the needs of the market for low-cost processors, and was IBM’s first generation of the PC used. The available clock frequency of 4.77,8,10 MHz. About 300 instructions, 29000 integrates more transistors. 1979: Arcade game “Space Invaders” release, caused a sensation. Soon make a similar large-scale popular game consoles, their income than the U.S. film industry. 1979: Jean Ichbiah developed Ada computer language. June 1, 1979: INTEL has released eight of the 8088 microprocessor, solely in order to meet the needs of low-cost computers. 1979: Commodore PET released using a 1MHz 6502 processor, monochrome display, 8K memory on a computer, and may need to buy more memory expansion. 1979: the invention of low-density disks. 1979: Motorola Announces 68000 microprocessor. Apple’s major suppliers for the Macintosh, successor 68020 used in the Macintosh II models. 1979: IBM Corporation seeing the PC market share by Apple and other computer companies, decided to also develop their own personal computers, in order to expedite the launch of their products, they are a lot of work with third parties, including Microsoft, to assume its operation system development work. Soon they will be in the August 12, 1981 launched the IBM-PC. But also the rise of Microsoft later, Shi adequate fertilizer.